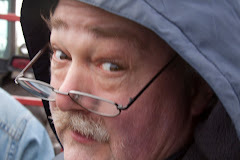 Well, last week, I celebrated some personal milestones as well as a happy reunion, by sharing some of the all time favorites of mine which have come to me from others' collections. At the time, I also meant to mention that the same happy week had brought the news that I am, for the first time, a Great-Uncle, as my niece and her husband have welcomed their first child. As promised, here is part two of "my gifts to you", this time featuring three classics from the mind of Rodd Keith. I assume that these tracks have circulated somewhat, but also believe that they are largely unheard by the larger song-poem loving community. All three of these are certainly good enough that they should have been anthologized by now. Again I'll mention that since these were sent through e-mail and/or via the mail on CD, I don't have the b-sides or label scans for these three tracks. Next up, we take a trip over to Film City, for a ride with The Swinging Strings, courtesy of Rod Rogers, with the happily ridiculous title "Give Me an X-Ray Picture of Your Heart". Rodd really sells the story song, and genuinely soars on a really nice bridge. That section, about "Dr. Brown", despite the goofy lyrics, is just lovely, and Rodd's vocal never indicates for a moment that he's singing lyrics which are anything less than classic. 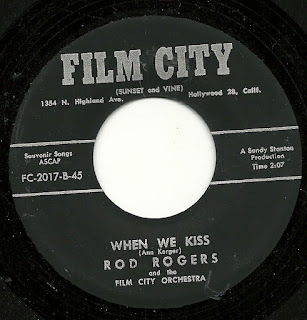 Finally, back to Preview, for one of the earliest releases on that label (number 1002), in which Rodd shows more than a bit of his Film City style. But what else could have possibly been called for a song called "Down The Mississippi-Ippy-Yi"? Here we have another story song, taking us all the way from a wedding to a 50th anniversary, with a riverboat tying both occasions together. To me, this sounds unlike any other Rodd Keith record, with the scratching guitar, the smile so apparent in his vocal, the minimalist backing, and the big finish, which to me is worth the price of admission, both for Rodd's ending vocal, and for the guitar, which sounds very much to me like a lift from Les Paul's arrangement of "How High the Moon". I know that at least one of these tracks came to me from my friend Michael in New York, and deep thanks again go to him. Unfortunately, after all these years, I've lost track of exactly where the other two tracks came from. Many thanks to whoever provided me with them, and for the many years of enjoyment I've had with them. I hope you enjoy them just as much. These last four days have been pretty wonderful, as I hoped and thought they would be. On Saturday, I saw one of my two oldest friends, and spent a nice amount of time with her - this was only the second time we'd been together in about 28 years, so that was really special. Then yesterday, the 21st, was my daughter Wendy's 21st Birthday! And today? Well, today, my wife and I celebrate our 24th Anniversary. So to honor and reflect these happy times, I wanted to give a gift to all of you who like to look around in here from week to week or time to time. So I'm casting aside one of my rules for this site and throwing my collection wide open for the next two weeks, in a way I have usually avoided. You see, I've deliberately made this site almost exclusively about records of which I physically own a copy. However, this has always meant that there is a large number of song-poems which I own only on tape or as files, which I've obtained in trade or otherwise, from other generous collectors, over the past 16 years of collecting and sharing. And a smaller number of those are truly great, and not generally known in the song-poem world. While it's likely that some of the tracks I'll be sharing this week and next do float around in collectors' circles, I'm guessing that many of you who visit here have never heard (or even heard of) most or all of them, and I want to rectify that, because these are really great records. Due to the fact that these were all shared with me from other collectors, I have to go with the sound quality in which I received them, and I don't have scans of any record labels for these two weeks of posts. 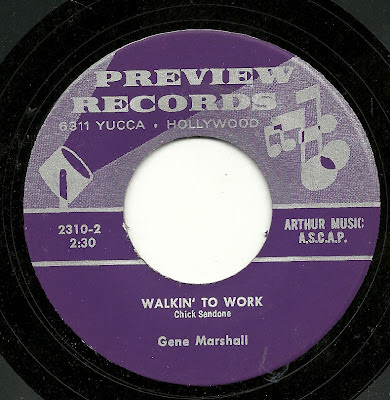 Next up is a record from an otherwise unknown artist, working within the Film City family, in this case on the Endeavor label. The song is "My Point of View", and it opens with a flourish which may well be my favorite 8 second blast of Chamberlin work ever. It doesn't quite live up to that insanely forceful opening, but how could it? The singer, Gus Hewstan (with the ever present Film City Orchestra) has a perfect amount of smarm for the pleading lyrics, and he really sells them (I LOVE the way he sings "one that's been both'rin' me"), even when it's hard to tell exactly what they mean (is that "there's romance on my hands"?). The Chamberlin track is hotter than most of those I've heard, with a hellishly busy (and wonderful) rhythm track. This is another one I'd probably put in that top 25. 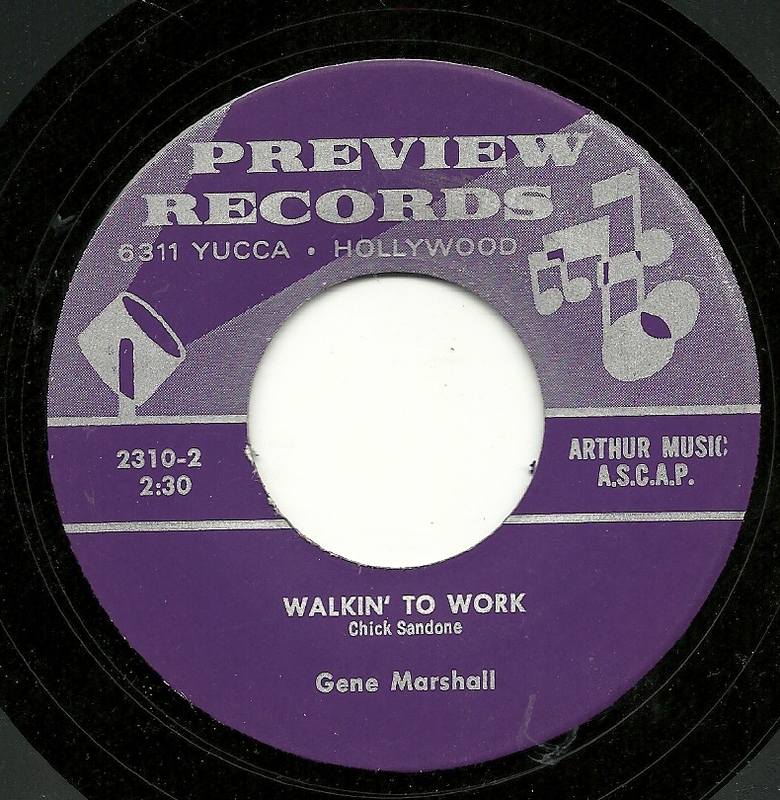 And finally, here are both sides of a single that appeared on the Cowtown label back in 1960, credited to Anne and Bill Calhoun. The AS/PMA website is non-committal as to whether this particular record is a song-poem, while saying that the label itself released song-poems and vanity pressings. The quality of the song writing and performing here could lend itself to either conclusion - the A-side sounding to me more like a vanity release and the b-side sounding more song-poemy, but what do I know. I enjoy both of these songs quite a bit, if admittedly not nearly as much as the first two offerings, above, and I think they both deserve a wider audience. Special thanks to Michael and Phil for this week's offerings! 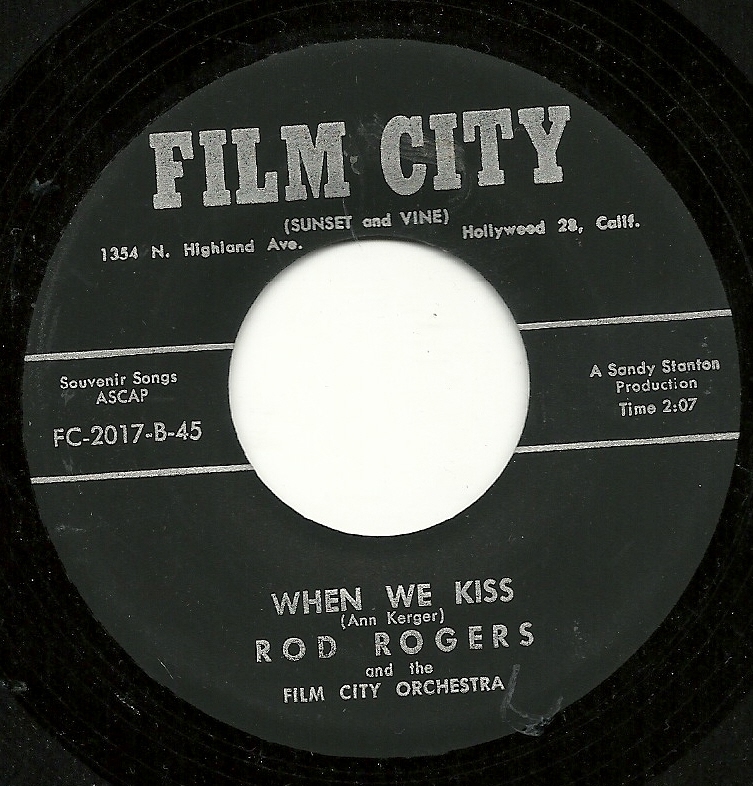 And there's never a bad time to share one of Rodd Keith's "Rod Rogers" records for Film City, and here's another winner, a bouncy slow twist number called "When We Kiss", complete with some patented genius Chamberlin orchestration - here identified as "The Film City Orchestra" instead of "The Swinging Strings", and, including a nice faux sax section solo section. Enjoy! The flip side, from the same song-poet, is not in the same league as "When We Kiss". 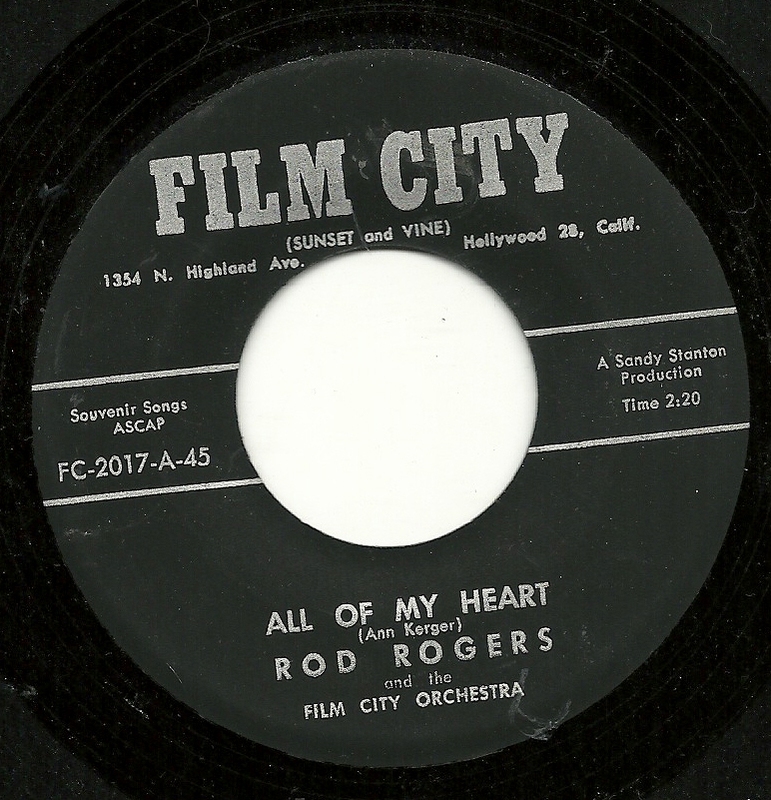 "All of My Heart is an example of Rodd in lounge singer mode, a little of which goes a long way with me, but the some listeners mileage may vary. Even within the averageness, there are some nice moments, such as the momentary solo around the 1:25 point - I wish there was more of that! On the flip side, Chick Sandone offers up a much more typical song-poem subject, what it feels like to be left behind by the love of one's life. 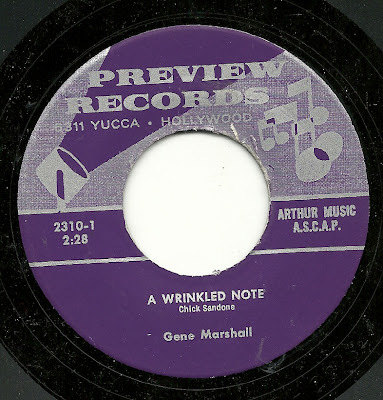 Unlike the flip side, "A Wrinkled Note" never gets past the cliche level, and even Gene Marshall turns in a less than adequate performance, actually going significantly out of tune on a few occasions. I wrote this post a few weeks ago, and thought I'd posted it, but clearly had not. But this is one of those rare times when I'm going to share my own work. Because a few weeks ago, an album's worth of material that I recorded back in 1996 and 1997, collected back then (and again now) into a collection titled "The Many Moods of Bob", is part of the online "Happy Puppy Records" label. These songs are from the humorous side of my writing and recording. The album contains several originals, a cover of a song-poem, a cover of a commercial and a couple of parodies. 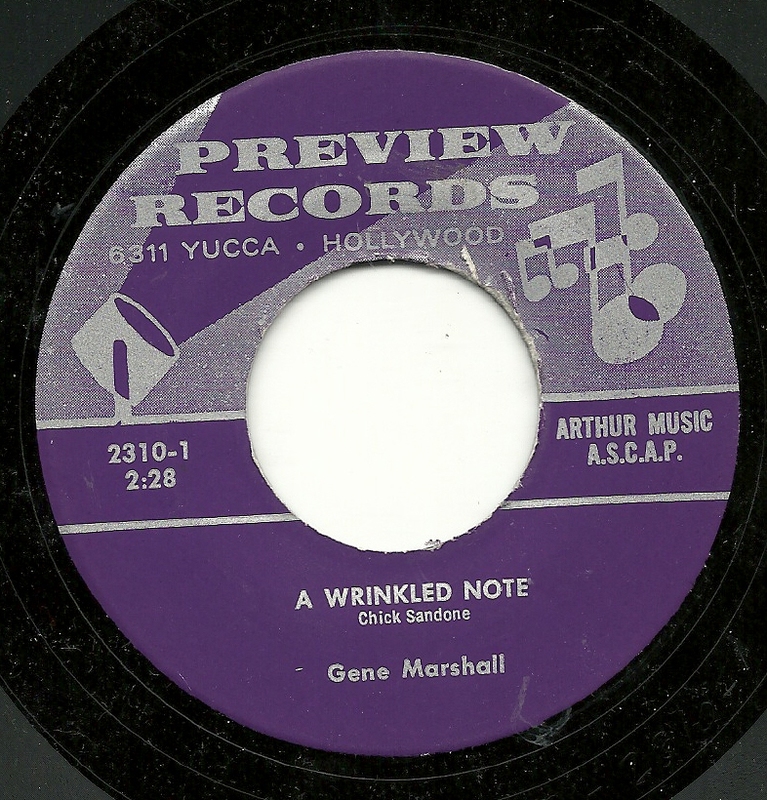 There are extensive liner notes, as well. I'm quite honored and a bit overwhelmed that material I thought would only be heard by a few close friends and family has been heard by hundreds and possibly thousands of people. The album can be found here. Have a listen, if you're of a mind to!